Antione T. Minor was born March 27th, 1985. He started doing music in 1997 under the name, The Captain Elite, in the hip-hop underground industry at the age of 12. He furthered his entertainment career by becoming a dual talent in 2005 as a model along with being a rap artist. From 1997 to May of 2009, he continued in the commercial hip-hop genre as well as modeling and developed a nice following. His internet views reached over the 100,000 mark over all of his various webpages. In the Spring of 2009 through a string of tragedies and life circumstances, he spent time alone with his Lord and Savior Jesus Christ. Through Jesus, he has obtained a stronger relationship with God the Heavenly Father. He gave up music, modeling and all of his fleshly desires and asked the Lord to show him the way. He started reading, fasting, praying, crying and diligently seeking the Lord’s face. After Antione felt he had died to all of his worldly desires and was stripped of everything, the Lord started restoring and rebuilding him. The Lord said to him, “I have given you a gift and spiritual gifts are irrevocable” (Romans 11:29), for the gifts and the calling of God are irrevocable. Antione realized that he couldn’t return God’s gift even if he wanted to so he began his new journey. God said to Antione “everything before now under the stage name The Captain Elite is dead. I placed you in the field to mold you for your true journey”. The Lord gave him scriptures to stand on and confirmed. This be was the rebirth of his musical hunger and thirst. Antione is passionate about the Lord Jesus Christ and he hungers and yearns for His word and love above all. General Manager of Marketing And Promotions – Gods Vessel music ministry presents a promising future as a Gospel Artist. The experience and his drive to share his talent is a credit to the kingdom of God. We were compelled to market and advertise his artistic abilities on a mass marketing distribution scale. We recommend Major Record Labels to Sign and push this Independent Artist without any reservations! 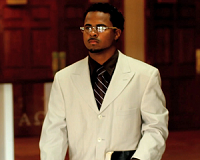 David Moore – Today, we have a special review of a Christian Hip Hop video from GODs Vessel. The video was released on September 26, 2012. This review was requested from our friends at the Devine Jamz Gospel Network, they promote Christian artists for an affordable love donation; so if you are a Christian artist, check them out. 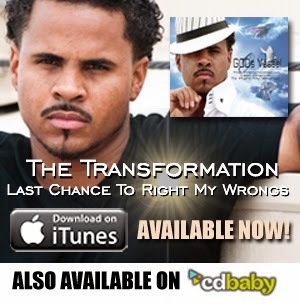 The song is called, “I’m a Rider for the Lord Yahweh,” from the album “The Transformation: Last Chance to Right My Wrongs” released July 17, 2012.The lyrics are by GODs Vessel (the artist,) and the beat is by Geno Montana. We have the music video embedded here on this page for those of you interested in checking it out. First thing that stands out about this video is the song itself, the artist and his vocals. He’s really good! One of the better Christian rappers I’ve heard, he is really talented, the lyrics are more than solid and the beat is great too. The video was produced by Silver Hooks Studios, they did a great job too. The video itself is pretty good for an indie artist, I like the car the artist is driving in in the video … the kids dancing are a great touch, but I really like that he’s in the ghetto going around singing about the Lord and passing out Bibles in gang territory. Let me tell you, you have to be a lot tougher doing that than you have to be to carry a gun through there. I really enjoyed this music video and the song, I think that we will hear a lot more from GODs Vessel in the future, we wish him the best and look forward to hearing more! Here’s an excerpt from GODs Vessel’s biography, he used to go by the name of ‘The Captain Elite,’ before giving his life to Jesus, “God said to Antione “everything before now under the stage name The Captain Elite is dead. I placed you in the field to mold you for your true journey”. The Lord gave him scriptures to stand on and confirm His word as well as the rebirth of the musical hunger and thirst. Antione loves the Lord Jesus Christ and he hungers and yearns for His word and love above all. For more information on this artist, click here. Also, be sure to subscribe to the Oakland Christian Music Examiner, because coming up we have an exclusive interview with J. Jackson, the lead singer/songwriter for that parody band, ApologetiX. I give this video 5 out of 5 and I highly recommend this artist for Christian Hip Hop fans! We had the pleasure of work with Christian Hip-Hop Artist, GODs Vessel and helping him formulate what he calls the “Testimony” series where he discusses his journey from secular music to more spiritual theme music and the concept behind the songs on the project. Check out his story on the song concepts, “Shine”, “Talks Me And My Dad Never Had”, “Overcame”, and “Been There, Done That”. J. Michael Wallace – My purpose for responding to you tonight is very simple, I feel like the Holy Spirit prompted me to reach out and encourage you to Stay Strong in your Faith, Trust Him and keep true to your gift and God’s purpose for your life. Secular RAP has done untold damage to our Nation’s youth, and while they may be addicted to RAP without understanding the damage from the message, you can reach many of those with God’s Message and Your Music. You may have been given the last name of Minor, but through Christ you can deliver a MAJOR Message for the Lord. I pray that He will anoint you with His Wisdom and fill you with His Courage to live for Him and share your gift and His Purpose with the world. Antoine “Gods Vessel” Minor is an awesome up and coming christian artist delivering the word of God in every song. You can still feel the street in his voice but the message is positive and motivating. I can’t wait to hear more of God’s Vessel in the future. Keep it positive and keep it real my brother and don’t ever forget to “pay it forward” in the name of the Lord Jesus Christ.